Bring a touch of the ocean's treasures to your beach themed wedding day with this exquisite pen set. From Fashioncraft's exclusive Finishing Touches Collection, the 7 .25" tall set has a 3 .5" x 2 .5´oval base and a 6 .25" long, metal-tipped white pen inserted. The white poly resin base has a beaded circle design around a hinged metal tip that supports the white pen holder, elegant carved poly resin seashells and starfishes attached, a raised sea foam blue wave design and blue rhinestones sprinkled throughout. 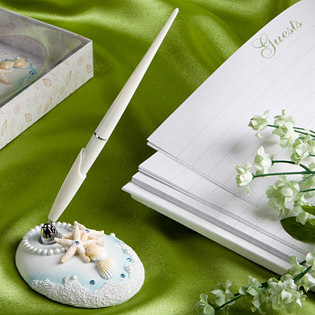 A stunning keepsake that can also make a useful and decorative addition to your home, each beach themed wedding pen and holder set comes delightfully packaged in a white with ivory seashell design gift box with a clear acetate window front for beautiful display and storage. Absolutely perfect for my beach themed wedding! I love this. Will be perfect for my wedding next year. Matches the guest book perfectly! I was afraid the pen might not write, but it did write. It was the perfect addition to the guest book. Matched exactly!